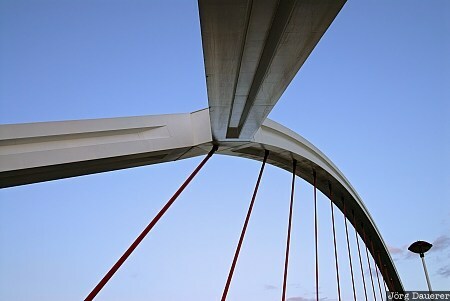 Abstract details of the concrete and steel construction of Barqueta Bridge (Puente de la Barqueta) which crosses the Guadalquivir river in Seville, Andalusia, Spain. It was was constructed from 1989-1992 to provide access to the Expo '92 fair. This photo was taken in the evening of a sunny day in March of 2008. This photo is part of the exhibition Bridges (February 2019). This photo was taken with a digital camera.